H. halophila is of significant interest because it is an obligately anaerobic purple sulfur bacterium, and among the most halophilic organisms known . 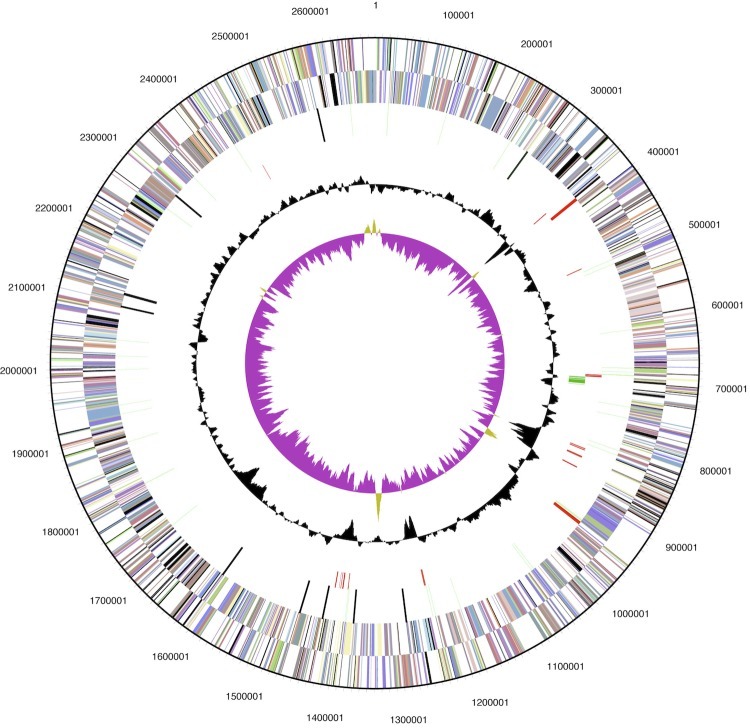 To date, genome sequences are available for two phototrophic purple sulfur bacteria, Allochromatium vinosum DSM 180 and the H. halophila SL1 genome reported here. H. halophila has very few growth requirements. However, it does need reduced sulfur compounds for growth, as does A. vinosum . Its pathways for both photosynthetic electron transfer [15-17] and nitrogen fixation  have attracted attention. In addition, H. halophila contains photoactive yellow protein [19,20]. This is the first member of a novel class of blue light receptors, and triggers a negative phototaxis response in H. halophila . The photoactive yellow protein (PYP) from H. halophila has been studied extensively for its biophysical characteristics [22-24]. Phylogram representation of a phylogenetic tree highlighting the position of Halorhodospira halophila strain SL1 relative to other organisms of interest, including members of the Ectothiorhodospiraceae, as well as additional strains that were included for comparison purposes, based on environmental and functional considerations. The strains (type=T) and their corresponding GenBank accession numbers (and coordinates) for 16S rRNA genes are: H. halophila strain SL1T, CP00544:380025-381562; Alkalilimnicola ehrlichii strain MLHE-1, CP00453:369818-369894; Thioalkalivibrio sp. HL-EbGR7, CP001339:2548250-2549775; Thioalkalivibrio sp. K90mix, CP001905:423231-424758; Allochromatium vinosum DSM 180T, CP001896:112452-113967; Ectothiorhodospira halochloris M59152; Burkholderia phytofirmans PsJN, CP001052:1541578-1543101; Desulfovibrio vulgaris subsp. vulgaris strain Hildenborough, AE017285:105921-107426; Rhodobacter sphaeroides 2.4.1, CP000143:1-1464; Rhodospirillum rubrum ATCC 11170, CP000230: 192528-194004; Escherichia coli B strain REL606, CP000819: 226609-228150. The 16S rRNA sequences were aligned by MUSCLE . The tree was determined by the maximum likelihood model of PhyML  and rendered with TreeDyn , using the “one click” pipeline of the Phylogeny.fr web resource . The genome is 2,678,452 bp long and comprises one circular chromosome with 67% GC content (Figure 2). For the main chromosome, 2,493 genes were predicted, 2,407 of which are protein-coding genes. A total of 1,905 of protein coding genes were assigned to a putative function, with the remaining annotated as hypothetical proteins. In addition, 31 pseudo genes were identified. The properties and the statistics of the genome are summarized in Tables 3-4. Deole R, Challacombe J, Raiford DW, Hoff WD. An Extremely Halophilic Proteobacterium Combines a Highly Acidic Proteome with a Low Cytoplasmic Potassium Content. J Biol Chem 2012.